Let Kids be Kids with 3D Printing and STEAM. Children learn a lot of abstract concepts in school, in science, technology, arts, engineering, math and history that could be better displayed with the use of gamification, a puzzle element and our own past. For instance, the Pyramids are an abject lesson in trigonometry and geometry. Other artifacts could help students grasp complex concepts with the help of these 3D printed plans, a little storytelling and the chance to solve the riddle themselves. We present AutoConnect, an automatic method that creates customized, 3D-printable connectors attaching two physical objects together. Users simply position and orient virtual models of the two objects that they want to connect and indicate some auxiliary information such as weight and dimensions. Then, AutoConnect creates several alternative designs that users can choose from for 3D printing. 3D printing non-profit e-NABLE has been lending a helping hand to an increasing number of people with disabilities in the form of 3D printed prosthetic hands. 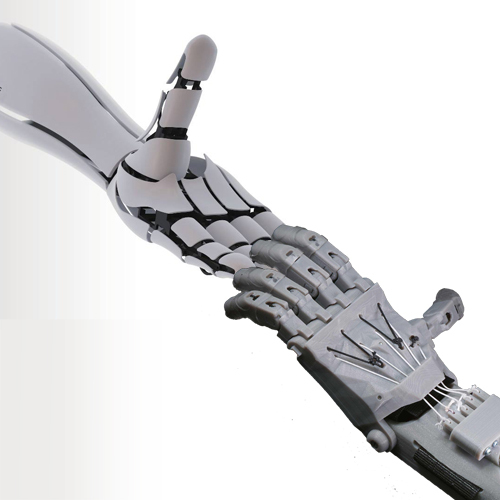 While e-NABLE works on their own brand of prosthetics, another group in Japan, exiii, is working on 3D printed bionic arms. Now, both organizations are receiving their own helping hands from one of the largest tech companies in the world. Through Google’s non-profit wing, Google.org, e-NABLE and exiii are received grants to aid in their missions to provide those in need with custom, 3D printed prosthetics. More than 10,000 disabled dogs are now able to run faster, jump higher and play harder - thanks to 3D printed metal orthopedic knee implants that 3D Systems manufactured for Rita Leibinger Medical.